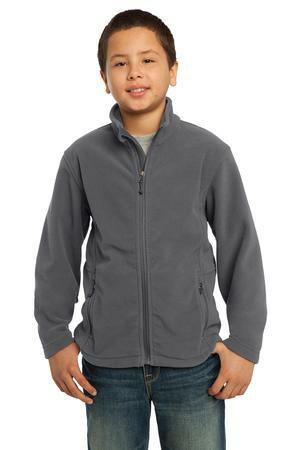 The Port Authority Youth Value Fleece Jacket Style Y217 is available in Youth Sizes: XS(4) S(6-8) M(10-12) L(14-16) XL(18-20) and can be purchased in your choice of the following colors: True Royal, Black, Forest Green, Iron Grey, Maroon, Pink Blossom, True Navy and True Red. Excellent mid weight fleece jacket. The Port Authority Youth Value Fleece Jacket Style Y217 is available in Youth Sizes: XS(4) S(6-8) M(10-12) L(14-16) XL(18-20) and comes the following colors: True Royal, Black, Forest Green, Iron Grey, Maroon, Pink Blossom, True Navy and True Red. The product description and its features are as follows: Excellent mid weight fleece jacket. Be the first to review “Port Authority Youth Value Fleece Jacket Style Y217” Click here to cancel reply.